Is there a translation of Jason's speech somewhere? Happy Birthday, Michaelis all the best to you. A New York Times article says that according to a recent poll, 40 percent of adults in the USA and Britain admit to sleeping with a plushie. If it wasn't for Yuzuru: I would never have heard of Joe Hisaishi, which led me to watching Studio Ghibli films, which led me to watching any eng sub Japanese movie I can get ahold of, which led to studying Japanese. I would not have rekindled my love for the sport, which fell off a few decades ago. I would never have travelled by myself to Helsinki to watch a competition live ( I would never have even thought of doing anything like that, and I would not have ended up in a fan cam on YT . Many thanks to all the seasoned satellites who posted info on how to get tickets and do the trip). 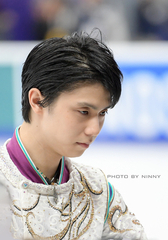 Finally, because of Yuzuru, I stop and think WWYHD? when I'm about to cut corners on a task or project. He is really an inspiration. guiltypleasure replied to robin's topic in Community Talk: Tickets, Meetups, etc. This morning Bjork & Bostrom replied to an inquiry about hotel and ticket packages. Kimmo Kannas responded that they will be offering packages. www.bjork-bostrom.fi I've never done before this myself, just a disclaimer here, but I think I may give it a shot. I've never been to a competition; there's no time like the present!